Ghirardelli. Because you really, really love chocolate. 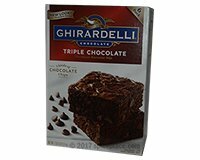 Now get Ghirardelli Brownie Mix in an even larger 6 pack size. This package makes 6 batches of brownies. Premium Brownie Mix with Ghiradelli Chocolate. Because you really, really love chocolate. That's why we make our brownies with a generous measure of THREE kinds of Ghirardelli chocolate chips: rich semisweet chocolate chips, creamy milk chocolate chips, and double chocolate chips. We add them to the perfect blend of the finest wheat flour, rich Ghirardelli cocoa, a hint of sweet vanilla flavor, and of course, no preservatives. Our brownies are the darkest, the richest - and so wonderfully dense and chewy. With three kinds of chocolate chips we know they're the best you'll ever taste. Semisweet Ghirardelli Chocolate Chips, Ghirardelli Milk Chocolate Chips, & Ghirardelli Chocolate Chips. Yum! Ingredients: Sugar, enriched bleached flour (wheat flour, niacin, reduced iron, thiamin mononitrate, riboflavin, folic acid), semisweet chocolate chips (sugar, chocolate liquor, cocoa butter, soy lecithin, vanilla), partially hydrogenated soybean and cottonseed oils, natural cocoa, bittersweet chocolate (chocolate liquor, sugar, cocoa butter, soy lecithin, vanilla), milk chocolate chips (sugar, cocoa butter, chocolate liquor, milk, soy lecithin, vanilla), cocoa (processed with alkali), wheat starch, salt, natural and artificial flavors (contains milk derivatives), sodium bicarbonate. Allergy Information: This product contains wheat, soy and milk. It is made on equipment that also makes products containing egg and tree nuts.